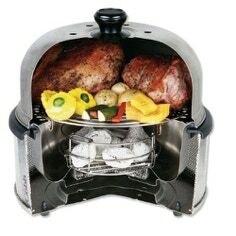 Whilst the cost of the Cobb BBQ (around £100) may put some people off, if you are prepared to invest in one you will be rewarded with not just a bbq but much more of a outdoor cooking system. You will find it very versatile, if you just want burgers or hot dogs then you would probably go for a cheaper bbq but if you like entertaining and doing different outdoor food, as well as the usual burgers and sausages, then you will find the Cobb is a delight to use. It looks stylish but at the same time it is functional and portable so you can it take away on holiday with you, we enjoy camping and it is ideal for taking with us in our camper van, it doesn&apos;t take up much room and is easy to transport in its custom made bag. When we opened the box we found it a little difficult to understand how it assembled but after looking at the instruction manual (which comes in six different languages) we referred to the exploded view and worked it out from there but it would have been nice to have some written easy to understand instructions. The Cobb consists of the outer casing into which fits the inner sleeve with moat, in the inner sleeve there is a fire grate for the cobble stone or charcoal briquettes, on top of that you put the non stick teflon coated grill grid and finally the dome cover. There are various extras which can be bought to enhance the cooking experience including a fenced roast rack which is ideal if you want to roast a joint or a chicken, cobble stones which are compacted charcoal impregnated with a built in fire lighter for ease of combustion, a carrier bag to transport your Cobb and a comprehensive cook book with lots of ideas for those long summer afternoons and evenings in the garden. My first attempt was cooking two chicken legs, I used the cobble stone and a word of warning here - when the cobble stone is lit stand well back from the Cobb because it does flare up for a minute or so until the flames die down. When the cobble stone turned white I put my chicken on the grill grid, at this stage the dome can be put on if you like a more smokey flavour to your food. I was surprised how quickly and how well the chicken cooked. After around 30 minutes they were a lovely golden brown colour (see video below) and cooked perfectly. The cobble stones last for up to two hours cooking time so there was still plenty of heat to cook something else if I had wanted. For my second cooking experience I tried cooking with charcoal briquettes, these are placed in the fire grate and a couple of fire lighters lit underneath, again you need to wait until the charcoal is burning white. This time a couple of sirloin steaks were placed on the grill grid, depending on how you like your steaks it takes very little time to cook, I put the dome on the Cobb because it was windy and a little cool (mid April) this helped cook the steaks to perfection and they went down well with some chips and salad, washed down with a nice glass of red. I didn&apos;t try using the moat but I am told that when roasting you can add water, beer or cider etc., to the moat to infuse your food with some lovely flavours and keep it moist. I will try that another time and report back here. Also if you did want a more smokey flavour then when cooking on the rack or grill, place some wood chips (apple oak or hickory) directly onto the heat source after soaking them in water first, then place the lid on. The Cobb is very versatile there are lots of different things you can cook and I intend to work my way through the cook book and try them out. The Cobb itself can be used on an outdoor table quite safely or on the grass and it won&apos;t burn the surface, however ON NO ACCOUNT MUST IT BE USED INDOORS this is highly dangerous and can cause death from carbon monoxide poisoning. Finally when your guests have gone and it&apos;s time clear up and clean the Cobb, the non stick Teflon coated grill grid will easily wash and look as good as new. The ashes can be just emptied when cold from the fire grate and a quick wash around the moat and your Cobb is ready to go again. Conclusion: You may think the Cobb is expensive at just over £100 but if you like eating alfresco you will find it an invaluable aid, it is not just a BBQ it&apos;s a outdoor cooking system that not only looks good but the food cooked on it tastes good. You can view our video review below.